Recently we added a new sample to our public data for semantic segmentation challenge. In this notebook I describe what this challenge is about and go over the sample contents. The goal is to make this sample Here's the outline. If you want to learn about this data set just in general, you may want to read all sections in this order. That should get you familiarized to start the main proposed challenge, semantic segmentation algorithm training. If you are looking into labels for _object detection algorithm training_, you should check out section 3! If you are looking into labels for _instance-aware segmentation algorithm training_, you should checkout section 5! ... but before anything, let's start with basic package imports. We will use test sample file to study the sample in this notebook. In this challenge we train a machine learning algorithm to perform pixel-level image analysis. The task is to classify every pixel in an image (i.e. segmentation) into one of pre-defined set of object classes (i.e. semantics) that the pixel represents.. Unlike image classification, in which you only need to give one object label for the whole image, semantic segmentation algorithm can be used to identify multiple object types and locations at pixel level. An output of an algorithm should look exactly like an input image (same size, same spatial resolution) except for the point that pixel values indicate an object category at each pixel. In this sample, there are only 3 pre-defined object categories: shower (electromagnetic shower to be precise, electron or gamma ray), track (all other particles), and background (pixels without energy deposition from a particle). So how can we train our algorithm? We can use supervised training with labels provided in the sample. How to define loss is up to us. One method is to use softmax (multinominal logistic loss) calculated per-pixel categorization and compute an average over all pixels. # A utility function to compute the 2D (X,Y) range to zoom-in so that it avoids showing zero region of an image. On the left, you find an image that contains multiple particles. The label image is shown on the right. To be pedantic, our task is to train an algorithm to output the right image from the left :) If you could not follow how I accessed image data from the file, you may want to read about "Browsing Classification Data" and/or follow more explicit list of tutorials. Which means 64886 background, 520 shower, and 130 track pixels. OK, one more question before moving onto the next topic: **Is this label image good at pixel-level? ** If we are to use the right image as a label, it is better be correct at pixel-level. We can check the precision of object labels by using it as a mask to visualize three category of pixels in the input image. ... which looks pretty good! By now you might have wondered "what about pixels where both track and shower particle deposit energy?" Very good point! Indeed that happens although the fraction to all none-background pixels is quite small. In this sample, we followed a convention that such pixels are labeled as track. In future, we plan to make a sample in which a pixel is allowed to have a fractional categorization (i.e. X% track and Y% shower). One way to define such fraction could be the ratio of particle energy deposition from all contributing object categories. If you are interested in this sample and/or have a different suggestion, by all means contact us! Below you find a list of conditions used to generate this sample. The goal was to make a good mixture of shower and track particles with a "reasonable" (not too boring) particle multiplicity per event, so that it suits training an algorithm for separating track and shower particle trajectories. The total particle multiplicity per event is set to be uniform between 2 to 5. A particle to be simulated is chosen from 4 categories with equal likelihood (25% chance per category). Isotropic momentum. Each category comes with a uniform kinetic energy (K.E.) distribution and allowed per-event multiplicity range shown below. Category 0: light lepton (electron or muon) with K.E. range from 50 to 1000 MeV and multiplicity range from 0 to 3. Category 1: gamma ray with K.E. range from 50 to 1000 MeV and multiplicity range from 0 to 2. Category 2: charged pion (pion or anti-pion) with K.E. range from 50 to 1000 MeV and multiplicity range from 0 to 2. Category 3: proton with K.E. range 50 to 400 MeV and multiplicity range from 0 to 3. All particles are generatd from a unique 3D point (i.e. event vertex). This position is uniformly distributed within the simulated volume over the events. A 3D sub-volume of 128 cm$^3$ is cropped and stored per event. The volume is defined to contain the event vertex and maximize the containment of particles' energy deposition in space. With these constraints, the cropping algorithm is free to randomize the 3D sub-volume position (to randomize event vertex position within the cropped sub-volume). Energy deposition for individual particle is stored in a 3D voxel of 0.5 cm$^3$ in MeV unit. This is projected onto three 2D planes: along x-y, y-z, and z-x axes. When stored in an image format, a scaling factor of 100 is applied for all pixel values. Events are filtered out if any of three 2D projection images have less than 5 pixels with pixel value >= 10 (which corresponds to 0.1 MeV prior to scaling). The minimum threshold of 10. is applied to all pixel values (i.e. a pixel with value below 10 is set to 0). Note that, per event, shower (electron or gamma ray) vs. track particle multiplicity ratio is not quite the same. The category 0 has 50%-50% chance. But only 1 out of 3 other categories can generate a shower. 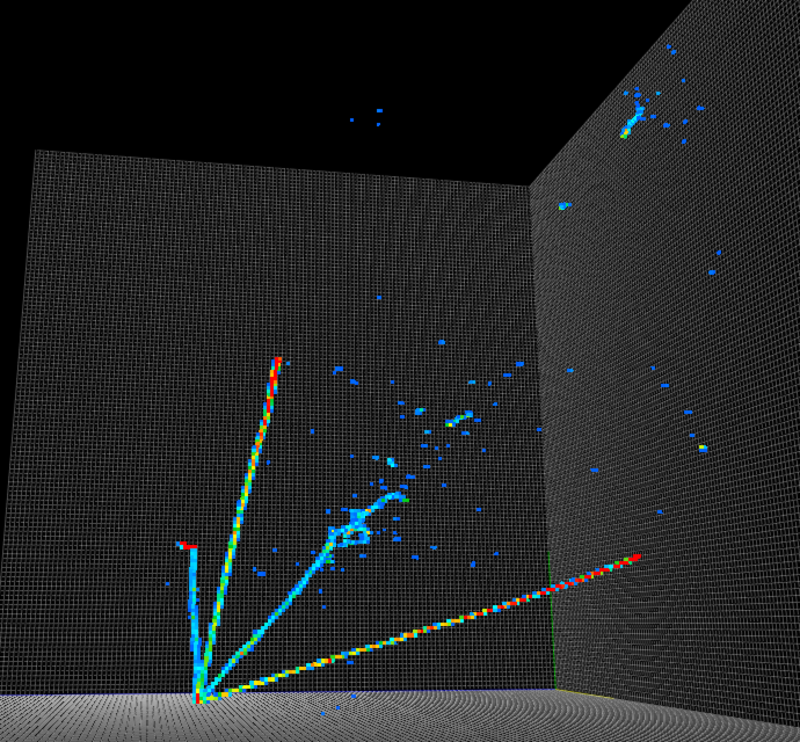 So, multiplicity-wise, the sample slightly favors to generate more track particles. However, in terms of pixel counts per event, we may find more shower type pixels because shower particle trajectory tends to be more complicated and spread out in space. We will look at kinematics and multiplicity distributions in later part of this notebook. Visualizing some random contents of the files might help feeling more comfortable about types of events included in this sample. Here's 10 random event dump! Yeah, let's start by listing what data products we have in this file. We already looked at **image2d_data_tree** and **image2d_segment_tree**: these are input data image to an algorithm and label (i.e. answer) to be used for supervised training. If you jumped to this section from the top, you can read previous section where we explored them briefly. Let me describe 3 more data products in the list below. We already covered this data product in classification challenge sample. This is particle (i.e. C++ larcv::EventParticle) data product which contains information about generated particles, called primary particles, that are injected into the simulation of a particle's trajectory in the detector medium (called tracking simulation). Note that, unlike a single-particle image classification dataset, we see more than one particle stored per event in this sample. This is also particle data products but it stores the output of particle tracking simulation. As a result, it contains additional information such as deposited energy by a particle which forms a visible trajectory in an image, secondary particles that are created by interactions of the primary particles in the detector, and so on. This is 2D cluster data product (i.e. C++ larcv::EventClusterVoxel2D) that stores a cluster of pixels per particle instance. This data product is not necessary to train semantic segmentation algorithm (though can be useful), and is included for your algorithm R&D; purpose beyond the challenge. We will cover this data product at the end of this notebook. Let's take a closer look at the difference between particle_mctruth_tree and particle_mcst_tree. We start with particle_mctruth_tree and will simply dump summary information about particles using a handy larcv::Particle::dump() function. Vertex (i.e. 3D position), Momentum, and Initial Energy are the parameters of a particle at its creation. These are information that must be available when injecting a primary particle into the detector simulation. On the other hand, Deposit Energy, TrackID, and BBox3D (3D axis-aligned bounding box defined by 2 diagonal points) are not filled. This is because particle_mctruth_tree holds information of primary particles after the generation but before the detector simulation. ... **Note a bug:** the Initial Energy is in the unit of GeV while it should be in MeV! Next, let's look at the same contents from particle_mcst_tree. Here, you see Deposit Energy and BBox3D are filled. Both information are only available after simulation of a particle's trajectory in the detector is finished. BBox2D is a projection of BBox3D onto 3 created 2D projection images. We also see TrackID is now filled. This is a unique, positive integer per particle that can be used to identify a unique particle instance. We used larcv::Particle::dump() function to be lazy and only see a part of information stored in this data product. There is a lot more to explore, and you can find all list by either looking at C++ header file or simply running python help function. It is worth mentioning that this data product also contains the parent particle information for the secondaries (and also the root primary particle, called ancestor) that created them. In the above text summary, you can see all particles' TrackID is matching with its Parent TrackID. This is a unique feature of the primaries (i.e. they are registered as their own parents). Note that Initial Energy is a sum of a particle's mass and kinetic energy while Deposit Energy is computed by collecting all granular energy depositions simulated per particle. So Deposit Energy should be always smaller than Initial Energy, and the difference can not be smaller than the particle mass. Looking at TrackID 3 gamma ray, Deposit Energy and Initial Energy are quite close. This means this gamma ray, which has 0 mass, deposited almost all its energy in the image. On the other hand, TrackID 4 gamma ray has $\approx180$ MeV gap. It means this gamma ray has escaped the image region and some of its energy is not included in the image. Deposit Energy can be useful to know how much energy of a particle actually contributed to make image features. Finally let me demonstrate bounding-box variable. Let's use the same event and draw the stored bounding box on the same image we already visualized in the previous section. This can tell us which particle data product corresponds to which particle we visually observe! I hope you are now thinking "I can totally use this to train an object detection network" :) You are correct! This paper used a similar sample to train a convolutional neural network to find an interaction region in an event. One last comment: can we do better than just bounding box? Can we know exactly which pixel corresponds to a particle instead of just a rectangular box? Can we know how much energy deposition in every pixel is made by each particle? **The answer is yes**, and that is what stored in cluster2d_mcst_tree and we will cover in the later section. We saw lots of pictures so far, so it's time to look at "plots" and exercise some quantification of physics parameters in the sample :) Let's take a look at several physics parameter distributions. We create pandas DataFrame in this example analysis. Let's check out multiplicity distributions and see if they look like what we expect (see the previous section for the sample generation configuration). First, the total multiplicity per event should be flat from 2 to 5. ... which confirms our expectation. How about particle-wise distribution? Let's compare electron, muon, and gamma ray. We expect electron and muon (from category 0 in configuration) to have the same multiplicity distribution within statistical fluctuation. Those two particles can have multiplicity between 0 to 3 while gamma ray is expected to be between 0 and 2. Further, likelihood of having at least one electron or muon (category 0) should be similar to that of gamma ray (category 1). Let's find out! Again, this seems to confirm our expectation. Finally, when we went over the sample generation configuration, we predicted the mean number of track particles to be slightly higher than shower particles. ... which confirms our hypothesis. Next, let's check on particle energy distributions for fun. We stored "initial kinetic energy" and "deposit energy" sums. If generated particles give up all available energy in the image, then these two quantities should match. If a particle deposit energy outside, then deposit energy would be lower. This shows we have a significant portion of energy escaped (i.e. not contributing in the recorded image). Is this OK?! It is OK :) Let's take an example of a muon which is generated in the range of 50 to 1000 MeV (see sample generation overview section). A minimum-ionizing-particle (MIP)#Minimum_ionizing_particle) muon deposits $\approx2$ MeV/cm. Given our image size of 128 cm$^2$, that means a high energy muon, say 500 MeV$, won't fit in our image region. So this is somewhat expected. We expect 3 to have the largest discrepancy between initial kinetic and deposit energy because both muon and pion can travel very far without stopping. We expect the best agreement in 2 because protons has very high stopping power (i.e. MeV/cm) and thus travel very short distance to deposit large amount of energy. We expect 1 to be somewhere in between: electromagnetic shower loses energy in a different process which also requires a large field of view. So some energy may not be recorded, but probably better than 3. These are roughly what we would expect. So protons are largely contained, and muon and pions have a fair chance of escaping. Here we come back to discuss about cluster2d_mcst_tree mentioned in the "file contents" section. This is a data product that stores a list of 2D pixels that belong to a particular particle stored in particle_mcst_tree. The stored 2D pixels also records the fraction of charge in the corresponding pixel of an image stored in image2d_data_tree. So you really get the full information about individual particle instance. In this notebook I cover the basics of cluster2d data product and some useful example applications. Let's start with the basics. How many particles do we have stored in particle_mcst_tree, and how many clusters stored in cluster2d_mcst_tree? Don't panic! Here's the reason why two numbers do not match. particle_mcst_tree stores particles that are tracked (i.e. their trajectories are simulated in the detector) but not all of them. In actuality the number of partickes tracked can become huge, sometimes more than 10,000, so we employ a certain criteria to record only useful ones with pretty low criteria thresholds to avoid missing information. cluster2d_mcst_tree stores all energy depositions per particle stored in particle_mcst_tree plus all energy depositions made by other particles (not stored in particle_mcst_tree) combined into 1 cluster. This is why the number of clusters stored in cluster2d_mcst_tree is always 1 larger than number of particles stored in particle_mcst_tree. Particle 0 has TrackID 1 and PDG 2212 with 89 non-zero pixels! Particle 1 has TrackID 2 and PDG 2212 with 43 non-zero pixels! Particle 2 has TrackID 3 and PDG 22 with 163 non-zero pixels! Particle 3 has TrackID 4 and PDG 22 with 920 non-zero pixels! My next natural question would be... "Can we draw clusters?" We sure can! Here, I use a handy function that converts cluster2d into image2d. image2d = larcv.as_ndarray(image2d) * 100. You can see that I multiplied "100." scaling factor to each image so that it would look like what we visualized from image2d earlier (see sample generation configuration). We can even plot all clusters and compare with the corresponding image data from image2d_data_tree. image2d_from_cluster2d = larcv.as_ndarray(image2d_from_cluster2d) * 100. As you can see, by combining clusters, we recovered image2d! But are they really identical? We can check some numpy array function returns. Wow, the mean is close but pixel count is very much different! Why?! What we missed is to apply another condition described in sample generation configuration section: apply $\geq10$ pixel value threshold. which shows not exactly the same, but quite close. I am not quite sure the reason that causes this difference. But it is possible because image2d is not derived from cluster2d and they are created in 2 parallel processes in the production chain. I opened an issue on github to look at this difference in the future release of larcv. Nevertheless, this does not change the usefulness of cluster2d! Finally, with what I showed already, you are right to think about an image with particle instance-wise label. In this notebook I swept the surface of the segmentation challenge public data set we added recently. The sample was primarily prepared for training an algorithm for track/shower pixel segmentation. However it can be used for training an algorithm for object detection and/or instance-aware semantic segmentation. I hope you find this data set interesting. As usual, if you have feature requests for future versions of this data set, contact us. If you find our software useful, please give stars to our software.